The Canon Color imageRUNNER C4080 Color Copier is a great asset for quality color printing and copying. 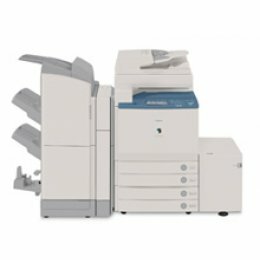 The Canon C4080 color copier can also scan and fax turning it into a hub of activity. The Canon C4080 Copier can print at 36 ppm in brilliant color. No wonder the Canon ImageRunner C4080 Color Copier is a favourite in all offices. The Color imageRUNNER model ships standard automatic duplexing, and a paper capacity of 1,200 sheets that can be upgraded to support a maximum capacity of 5,000 sheets through six sources. The Color imageRUNNER model offers a choice of three finishers that provide extensive stacking capabilities, multi-position stapling, saddle-stitched booklet output, and optional hole punching for professional-looking output. Flexibility to accommodate all job types on one machine.